Fiber crackers- what you need to know. Are you wondering what the buzz is about fiber crackers? These rectangular crisps have attracted a lot of attention on social media and in the world of weight loss. Here is what you need to know about them. One of the most popular brands on social media is GG Scandinavian Bran Crispbread. These crackers have been around for a long time (since the 1930’s) and are made in Norway. They’re one of the lowest calorie crackers with the most fiber — each cracker contains 20 calories and 4 grams of fiber. The original cracker has only three ingredients: wheat bran, rye flour and salt. 2. What do they taste like? Well, to be totally honest they’re not great tasting— on their own. Some people say they taste like cardboard. They’re definitely super crunchy and extremely dry. 3. Why to people eat them? Despite the lack of flavor, people choose to eat these crackers for the benefit of fiber. Fiber aids in digestion and helps with satiety (fullness), weight loss, reducing cholesterol levels and blood sugar control. Fiber, because it cannot be absorbed, makes its way to the colon where it feeds the bacteria in our gut, making it essential for gut health. 4. Do you recommend them? I do recommend them. They’re not something I discuss with every client, because every client I work with is different and therefore needs a different approach to getting enough fiber. Some people love the crackers because it keeps them full, which is great. Other people do better with getting their fiber from other food sources. 5. How many crackers should I have? When a client decides to incorporate these into their routine I recommend 3-4 crackers per day (12-16 grams of fiber). Then I recommend other fiber rich foods (fruits, veggies, whole grains) to meet the 30 gram fiber recommendation. 6. Where can I find them? These crackers are a little harder to find in stores. Health food stores tend to carry them. My clients order them from the website or from amazon. 7. Do you recommend any other brands? Another brand that is low calorie and high in fiber is Wasa Fiber crackers (the variety that says “fiber” on the packaging). My clients tend to like the taste of this brand better —it’s less dry. This brand is way easier to find in your local grocery store. 8. Do you eat them yourself? I do eat them, but I prefer the wasa fiber crackers because they taste better in my opinion. I don’t eat them everyday because my typical diet already has more than enough fiber. 9. Is there anything to be cautious of when eating fiber crackers? Yes! You don’t want to over do it with fiber crackers. Too much fiber doesn't feel great and can cause bloating and gas. If you don’t currently eat enough fiber you want to introduce fiber into your diet slowly. Start with 1 cracker per day and work your way up and make sure to drink plenty of water (at least 8 cups). 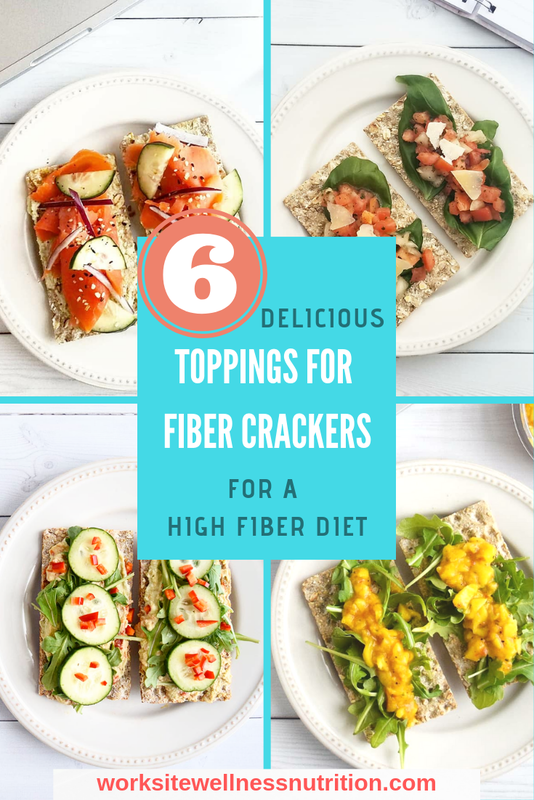 Definitely don’t rely on these crackers as your only source of fiber — if you do that you’ll miss out on other nutritious, fiber-rich foods. 10. What do you recommend putting on them? I recommend definitely pairing fiber crackers with something that will make them taste better. Avocado, mashed hardboiled eggs with everything bagel seasoning, salsa, hummus, bruschetta and pb&j are just a few of my favorite toppings. 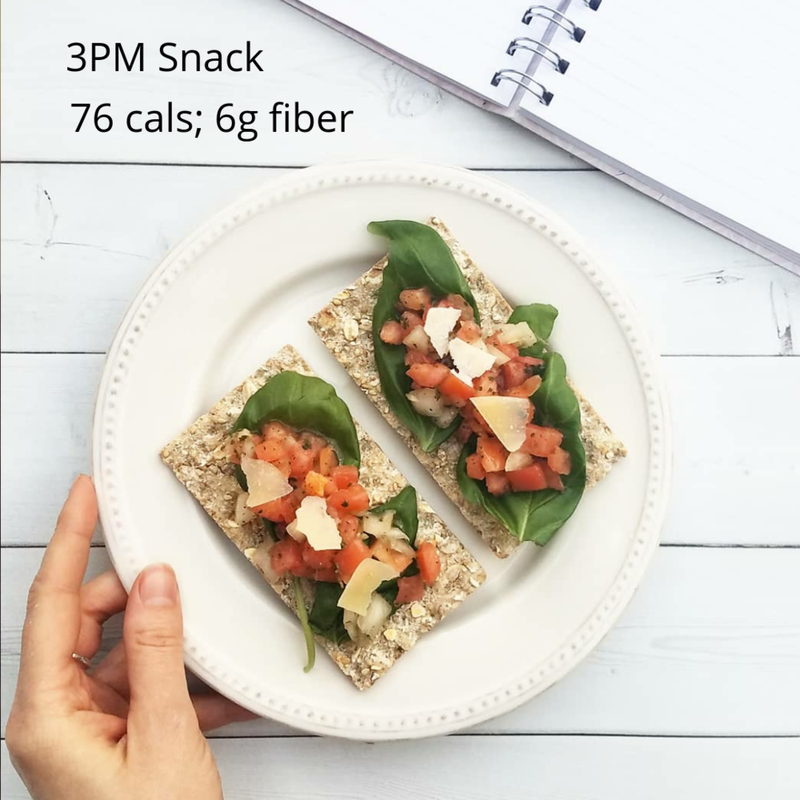 Do you have questions about fiber crackers? Have you tried them? What do you think? Leave any questions or comments in the comment section below. a Registered Dietitian Nutritionist (RDN), author, speaker and the gal behind Worksite Wellness Nutrition. I specialize in corporate wellness in the big apple (NYC). I’ve been helping people lose weight, eat better and feel their best for seven years as a dietitian. I literally LOVE what I do. I live the dream EVERY. SINGLE. DAY. I get to do what I’m passionate about, all while helping others. Thanks for stopping by! Please take a look around and enjoy!